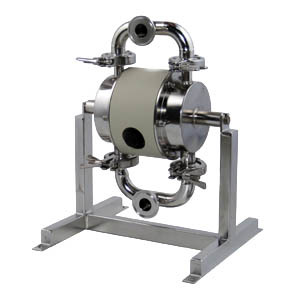 diaphragm pumps meet the demands of heavy industrial duties. The pump is created for reliable duty and with a minimal number of components enabling easy maintenance. Material: Aluminum, Steel, Stainless 316L, PE, PTFE, and Hygienic. PE & PTFE series are suitable for handling almost any kind of liquid whether it is viscous, chemically, aggressive chemicals, abrasive medias, concentrated acids and alkalis for heavy duty industrial application. 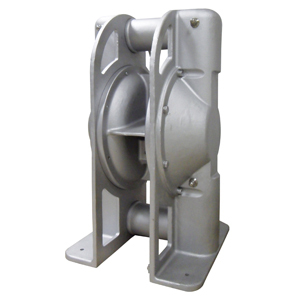 Metal pump made from Aluminium, Cast Iron, Stainless Steel and PTFE coated Aluminium. 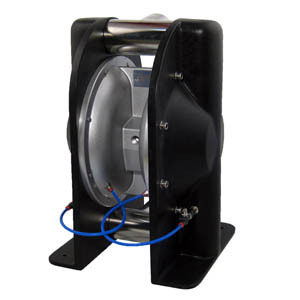 All metal pumps are available in explosion proof ATEX marked version. 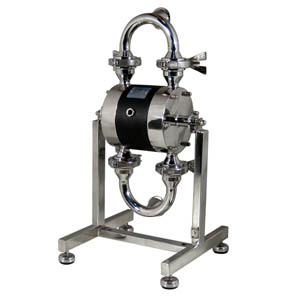 Sanitary series pump for food, beverage, pharmaceutical and cosmetic industries. Lubrication free air distribution system, maintenance free ball check valve system, and total visual inspection of the wet parts. and grapes juice, yeast, mash , distilling products, cream, etc. Powder transfer pump will handle different types of process powders, with specific weight from 80 up to 720 kg/m3 dry weight. No matter of how well the pump performs, it is of greatest importance how the air supply to the pump is controlled. By using the Tapflo guardian systems, level control, batch control, start & stop and filter regulators, etc. 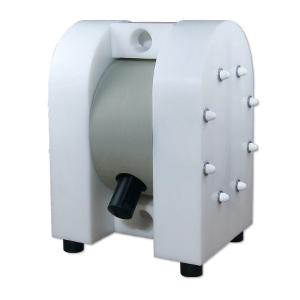 The Tapflo diaphragm pump is driven by compressed air. The two diaphragms, connected by a diaphragm shaft, are pushed back and forth by alternately pressurising the air chambers behind the diaphragms using an automatically cycling air valve system. One diaphragm creates a suction action when being pulled back from the housing. The other diaphragm simultaneously transmits the air pressure to the liquid in the housing, pushing it towards the discharge port. 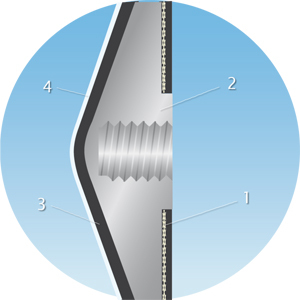 During each cycle the air pressure on the back of the discharging diaphragm is equal to the head pressure on the liquid side. 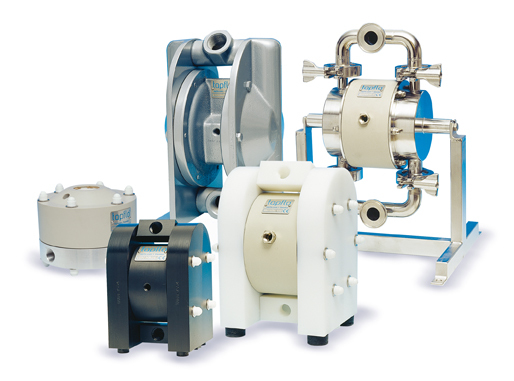 Tapflo diaphragm pumps can therefore be operated against a closed discharge valve with no adverse affect to the life of the diaphragms. Tapflo diaphragms are of sandwich compound construction, with an integrated metal core, provides a completely smooth surface in contact with the liquid, without any nuts or washers, no leak through. 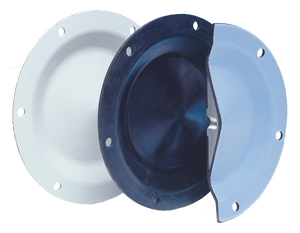 Our diaphragms have a lifetime of more than 13 million cycles. Diaphragm materials: PTFE, PTFE (food grade), EPDM, white EPDM (food grade), NBR (Nitrile) and FKM (Viton, on certain models only). 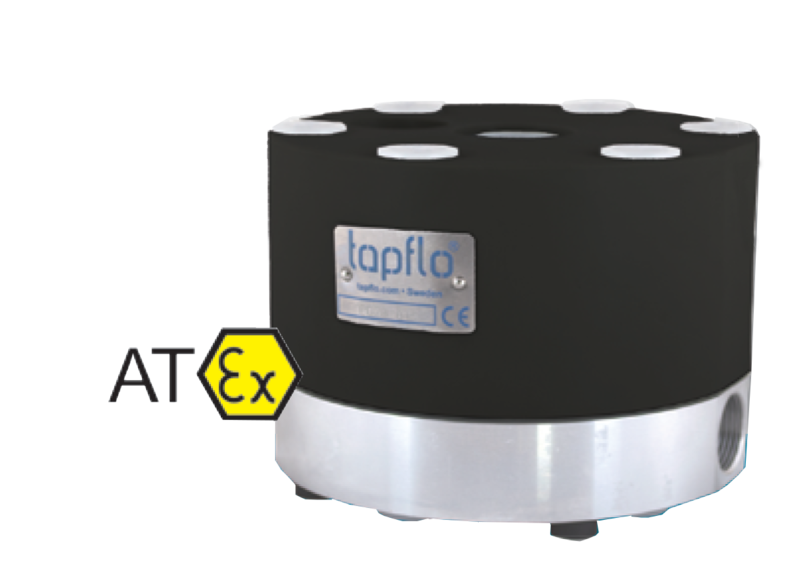 The Tapflo air valve is distributing the compressed air to the chambers behind the diaphragms. It has no deadlock position – the pump will always start automatically when air is supplied to the pump. For maintenance free duty with no lube air. 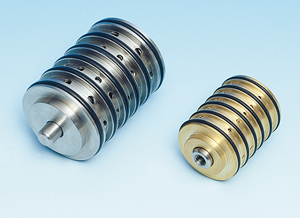 The valve body is made from brass or optional PET or stainless steel AISI 316L. The Tapflo pump is fitted with four check valves, making sure that the liquid is transferred in the right direction through the pump. 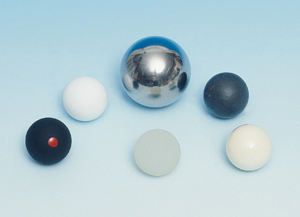 The valve ball is available in EPDM, NBR (Nitrile), PTFE, AISI 316L, polyurethane and ceramic to suit any kind of liquid.